Offering a secluded haven in the luxurious village of Roches Noires, Azuri Townhouse boasts sweeping views of the idyllic surroundings and cozy furnishings, perfect for those lazy days when you don’t feel like going out. 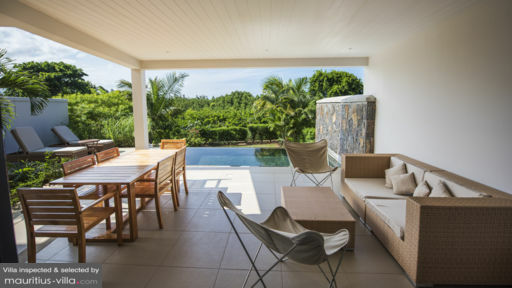 With plenty of room to accommodate larger families or even groups of friends and colleagues, this townhouse places you on the north-eastern coast of the island. Thanks to its large windows to let in plenty of sunlight, you will be able to enjoy a distinct sense of airiness and homeliness, Azuri Townhouse also provides free WiFi. Azuri Townhouse is beautifully-furnished to accommodate groups of up to eight persons in four spacious bedrooms, some of which boast spectacular views of the surroundings. The master suite is even equipped with a charming four-poster bed and en-suite bathroom so you can unwind with a refreshing shower and rejuvenate in all privacy after a long day. This particular bedroom also features a spacious balcony with rattan armchairs where you can lounge back and relax as you inhale the balmy tropical breeze. All four bedrooms are equipped with air-conditioning units, perfect for those warmer nights. 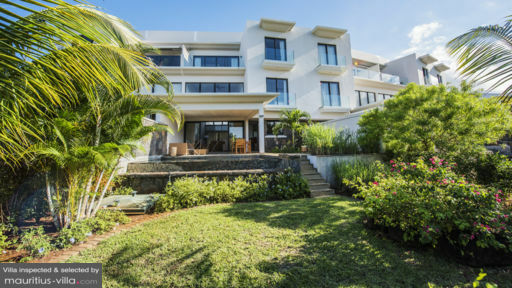 Boasting sweeping views of the lagoon and surrounding mountain ranges, the outdoor areas of Azuri Townhouse are ideal for guests who would like to soak up the beautiful tropical sun. Boasting a swimming pool, this villa also features a furnished terrace where you can enjoy your meals, Al-Fresco style. Sun loungers are also available so feel free to grab a good book and a chilled drink as you proceed to work on your tan. There’s also a spacious sitting area in front of the pool so you can relax as you revel in beautiful sunsets. Rest assured that the exquisitely cozy living areas of Azuri Townhouse are perfect for those days when you don’t feel like going out. 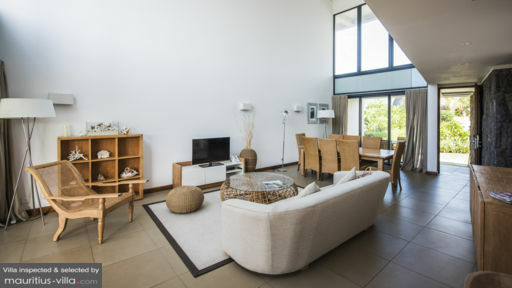 Best of all, the living spaces are wide and airy, infusing the whole villa with a distinctive sense of tropical charm. Decorated in muted beiges and whites, the living room boasts a comfortable couch which you can sink into after a hard day as you enjoy a movie on the flat-screen television. There’s also a work space and a dining table around which you can gather to enjoy a delectable homecooked meal. In the perfectly-appointed kitchen, you will find everything that you will need to prepare your meals, including a full-sized refrigerator, gas and electric stove, microwave, crockery, utensils and more. Complimentary housekeeping services are offered to ensure that you don’t have to muck about with these tedious house chores during your stay. The housekeeper will show up daily, except on Sundays and public holidays, and she will tend to your villa, including the cleaning up and maintenance of all four bedrooms and the bathrooms. You will also receive a 24/7 security as well as concierge service. For an added cost, additional services can be provided. These include an in-house massage and in-house chef. Upon arrival, you will also receive free amenities and consumables such as mineral water, olive oil, shampoo, body lotion, washing liquid and more. A welcome pack with added amenities can also be arranged at an extra fee. The scenic village of Roches Noires is known for its azure lagoons and spectacular waves that are perfect for travellers who would like to indulge in more energetic nautical activities such as surfing. A short drive away is found the lively capital city of Port Louis, home to the famous Caudan Waterfront Mall where you can indulge in as much shopping as you want.